Fifteen years ago, at the tender age of 27, I met a very incredible Jujitsu Master by the name of Brian Dossett, and I made a decision to learn his practical style of Combat Jujitsu. 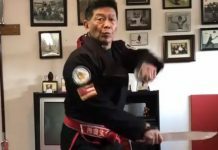 At the time, I was already a 3rd Dan in Korean Karate and also in the Cacoy Doce Pares Eskrima, but I wanted to learn more about his style of stand up Jujitsu techniques, especially the restraint techniques that are used by law enforcement and security officers. 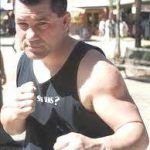 Firstly, I read an article about this man in the British martial arts magazine called ‘COMBAT’, and I enquired about his postal details, and then I wrote a letter to GM Brian Dossett, and so I introduced myself to him. I explained to him that I was a student of GM Cacoy Canete of the Filipino Martial Arts style of the Cacoy Doce Pares Eskrima (Stickfighting), and the Filipino Pangamot Jujitsu which mainly deals with weapon disarming. My first exposure to his style of Jujitsu, was all done by his instructional video tapes that I had purchased from him, and these tapes were so very crucial in my development in Jujitsu. In 1994, I invited GM Brian Dossett to come out here to Australia and to teach some seminars, and he has made a few trips since the first seminar tour here, and as a matter of fact, he is coming out here in March/April, and he will be teaching his style of Jujitsu while he is here. This was all a part of his world tour promoting his style of Jujitsu, and he is also visiting Los Angeles Auckland, Adelaide, Sydney, Wollongong and Adelaide. From the very start, I became interested in who this man was, and it is easy to see that he is larger than life, full of energy, and a real fountain of Jujitsu knowledge 40 years ago, Brian Dossett, already an accomplished boxer, started his journey in martial arts and at the time, there were few martial art schools available in the UK, and with Judo and Karate being the most popular. 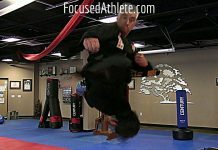 GM Brian Dossett learned what he could from many instructors of the different styles such as Judo, Karate and Aikido, and then he went onto attain black belts in these styles of martial art. 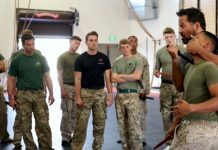 He was cross training nearly 40 years ago, at a time when it was frowned upon by many instructors! 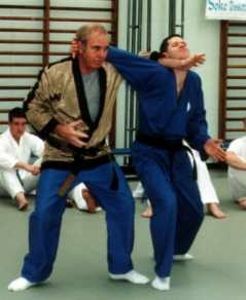 GM Brian Dossett had many jobs over the years, but it was during his time in the merchant navy that he began to learn about practicalaspects of the martial arts. As their entertainment, the navy men would have fights on the deck, with no mats and no ring, so he soon found out what techniques worked and what didn’t, learning from the others, and then showing them a thing or two. After a while, he started teaching people what he knew, not realising that he was showing them things in ways that had never been done before. Soon his own fighting system developed, he called it Spirit Combat Jujitsu. A blend of basic Ju Jitsu, Judo, Boxing and Kick Boxing, and at one time everyone in the UK called it ‘KICK-JITSU’. 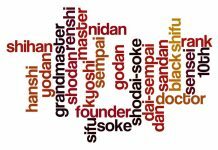 He now has the title of Soke (Founder), which was an honour bestowed upon him by his students, and he also holds the rank of 10th Dan in Spirit Combat (Again being awarded by his ‘MASTER’ students in the organisation). Over the years he has belonged to different organisation and has been recognized at different levels by all of the governing bodies of Jujitsu in the UK. Now he is the head of his own organisation. 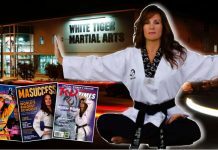 MAAS, Martial Arts All Styles, this is an organisation that promotes more affordable martial arts, with maximum safety and the highest standards of instruction. Now, 15 years into my Combat Jujitsu training under him, I have achieved ‘MASTER’ level under his watchful guidance, and his style of Jujitsu in conjunction with the Filipino Martial Arts! 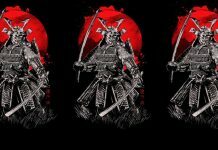 Spirit Combat Jujitsu offers a modern approach to Jujitsu, and there is no need to learn the Japanese language to describe all the techniques taught, and there is a more fun and friendly atmosphere that we all train in together, and without the politics either. That is not to say that the traditions of martial arts have been ignored, because respect is always shown in the Martial Arts School, and to the Instructors too.